The Library has a copier for public use. 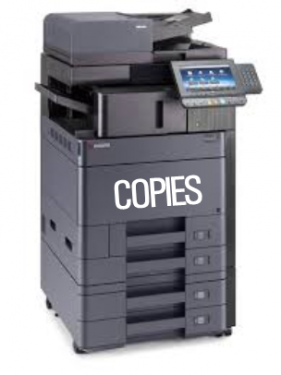 With its convenient document feeder you can print multiple pages at one time, either single sided or double. Letter paper (8 1/2″ x 11″): b/w $.15 per page side, color $.25 per page side. Legal-sized paper (8 1/2″ x 14″): b/w $.15 per page side, color $.25 per page side.